Miners have been decimated by the market downturn. In response, miners have started decommissioning hardware, mothballing rigs, and even selling hardware by the pound. Bitcoin and cryptocurrency proof-of-work (PoW) mining is a controversial topic. Mining is a process where computers continuously solve a difficult algorithm in exchange for cryptocurrency. This exchange consumes a massive amount of electricity, but also secures and processes transactions on the Bitcoin network. This excessive consumption of electricity is intentional. Decision-making power in Bitcoin is based on the agreement and consensus of miners. By making it very expensive to gain majority control of the Bitcoin network, the coin is able to remain more decentralized and more secure from hacking. Based on estimates from the most sophisticated Bitcoin miner, the Antminer S9i, mining a single Bitcoin takes roughly 51,000 kWh, the equivalent of one day’s electricity consumption for 1700 residential homes. At a standard electricity rate of $0.12 per kWh, mining one Bitcoin costs $6100. That said, the recent drop in market prices is cause for concern. 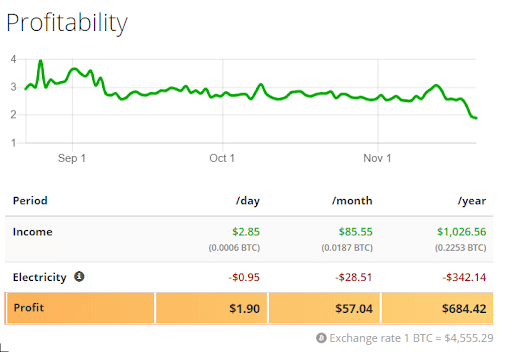 Lower Bitcoin prices make it less profitable to mine. Lower profitability results in less miners and the miners that remain are typically large-scale operations that can keep costs down. This impacts Bitcoin by potentially centralizing decision-making in the power of a few mining corporations. These corporations, such as Bitmain, are primarily based in China. Such high levels of centralization could trigger another hash war as seen in Bitcoin Cash. If two major mining companies disagree on the software-development direction of Bitcoin, it could cause a fork and shake people’s trust in the cryptocurrency. 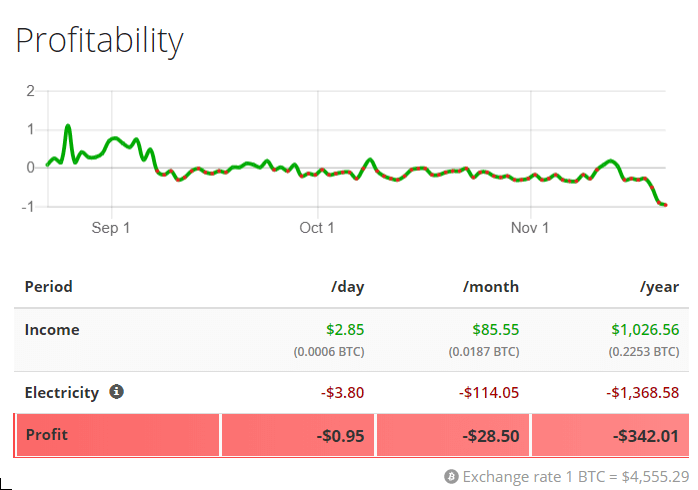 Given current market prices, even the most efficient Bitcoin mining hardware is unprofitable for the average person. Assuming an electricity rate of $0.12 per kWh, people who own an Antminer S9i would lose $340 per year to electricity costs. This does not even include depreciation of the hardware itself, meaning the losses are much higher than this figure. An S9i sells for roughly $550 with a two-year useful life, a depreciation rate of $275 per year, increasing the yearly loss to $615. That said, mining is not dead for the major players. There are many places in the world where businesses are able to secure electricity at a fourth-of-the-average rate. In many places in China, Eastern Washington, Canada, and Iceland, businesses can purchase electricity at $0.03 per KwH or lower. Given these figures, one Antminer S9i earns over $680 and gross profit of $405 after depreciation (however, industrial miners are able to purchase this hardware at a deeply discounted rate). Most mining facilities have thousands of these machines, allowing each facility to earn millions of dollars per year. Some miners are already feeling the heat of the market crunch. Giga Watt, a Washington-based mining service that rents and sells mining power and equipment filed for bankruptcy on Nov. 19. 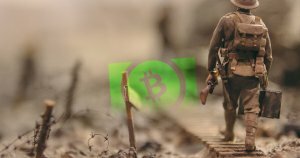 However, the company was unable to deliver on its promises of providing these services as the cryptocurrency market took a dive following the end of 2017. Unable to deliver on its promises, investors took to suing Giga Watt for selling unregistered securities and rescission of contract. Although many of these mining companies are privately owned, previously semi-profitable enterprises could become the next victims of the market downturn. What this turbulence spells for the centralization and security of Bitcoin, and the crypto markets in general, is still uncertain. 1320 watts per Antminer S9i * (365.25 days * 24 hours per day) / 1000 watts per kWh = 11,571 kWh per Antminer per year. One Antminer S9i mines 0.2253 BTC per year, given current market conditions, mining difficulty, and block rewards. 1 / 0.2253 BTC per Antminer per year = 4.439 Antminers to mine one Bitcoin per year. 4.439 Antminers * 11,571 kWh per year = 51,364 kWh per Bitcoin. Average electricity consumed by a residential customer: 909 kWh per month. 909 kWh / 30 days = 30.3 kWh per day per residential customer. 51364 kWh per Bitcoin / 30.3 per residential customer = 1695 residential customers. The post Bitcoin Miners Ruined by Downturn, “Selling Hardware by the Pound”; Giga Watt Files Bankruptcy appeared first on CryptoSlate.